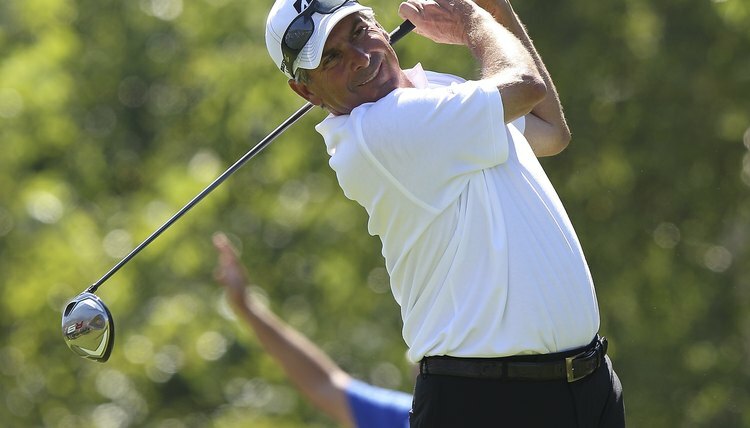 In his book "Total Shotmaking" Fred Couples emphasizes the importance of proper tempo. Golfers always recognize good tempo when they see it in another player’s swing. A swing with proper tempo looks like it requires little exertion from start to finish. The parts are all moving in harmony. A swing with good tempo looks fluid, rhythmic and may appear slower than it actually is. Proper tempo is one of the keys to both power--longer shots--and accuracy in golf. Golf Digest’s instruction book, “Breaking 100, 90, 80,” recommends a visual key to developing a smooth tempo with your tee shots. You imagine your driver attached to a set of wheels. Begin your swing by rolling these imaginary wheels back--keeping them on the ground for at least the first 12 inches of the backswing. In the book, “Breaking 100, 90, 80,” swing coach Rob Akins says keeping your arms and hands in rhythm with your lower body is the key to developing a rhythmic swing with proper tempo. You want to make a smooth, full shoulder turn on your backswing and then rotate your hips fully on the downswing until they are perpendicular to the target line. Fred Couples in his book, “Total Shotmaking,” cautions against beginning the downswing with a hard-driving, “lurching”-type lateral move. This action disrupts the body rotation needed to achieve maximum power. He tries to make a slight and smooth lateral move. What follows next in Couples’s swing is turning his hips to the left as he makes solid contact with the ball. Jack Nicklaus, in his book, “My Golden Lessons,” describes tempo as the rate of speed the club is traveling as it goes back and then proceeds back down and through the ball. He views tempo as one of the most difficult aspects of the golf swing to master--even for highly proficient players. To practice better tempo, he forms a mental image of his backswing and downswing happening at the same speed. In “My Golden Lessons,” Jack Nicklaus says golfers seeking to improve the tempo of their golf swing should try to emulate the tempo dancers use in a slow waltz--the beats of one-two-three, one-two-three. Work on incorporating this beat sequence as you practice your footwork--your left foot rolling inward as you swing back, and then your right foot rolling toward the target on the downswing. The book, “Breaking 100, 90, 80.” suggests that good tempo in a golf swing is a matter of applying a consistent amount of force from the beginning of the downswing to the follow through. Don’t make a conscious effort to speed up the swing. Think of how you want your hands positioned at the finish of your swing. Try to hold your finish position for a few seconds and maintain good balance. Keeping your grip pressure even throughout the swing also helps maintain proper tempo.